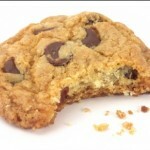 Ask anyone to name a type of cookie and chances are they will say “Chocolate Chip.” Accidentally invented by a harried cook who didn’t have time to melt the chocolate to make her favorite chocolate cookies, these yummy morsels have been a national favorite since the recipe was first published in 1936. I make some of the best chocolate chip cookies in the world. In fact, I almost cannot eat anyone else’s cookies. They’re often tiny, anemic, hard, dry, under-baked, burned, and/or greasy. They are simply no match for the big chewy sweet bites of heaven that come out of my oven. People ask for the recipe all the time. I tell them “Back of the bag” and it’s true. The secret to a perfect chocolate chip cookie is NOT the recipe. Like all things baked, the secret is in the process. First, let’s talk about tools. You will need a good quality kitchen mixer. It is possible to make chocolate chip cookies with a small electric hand mixer, but it is a lot of work and you won’t get ideal results. As far as making them by hand, I wouldn’t attempt that unless you have a couple of strong boys around the house who really want the arm exercise. You will also need a second mixing bowl for the dry ingredients. Your oven can be either gas or electric, but it must be accurate. As modern timers are highly reliable, under-baking and over-baking is most often caused by baking at the wrong temperature. If you are unsure of your oven, you can place a small oven thermometer inside and check the temperature. You are looking for 375 F.
Good baking sheets are critical to the process. There are a number of gimmick baking sheets on the market (air-bake or whatever). Avoid them. Also avoid those thin, flimsy baking sheets they sell at the grocery store. What you want is a couple of heavy-duty professional baking sheets that will really spread the heat. Try your local restaurant supply store or Smart & Final. Preheat the oven to give the temperature time to stabilize, and place the rack in the center so that the heat will flow around the cookies evenly. Let’s talk about the ingredients next. Do not attempt to substitute anything for the butter. Good quality fresh creamery butter is the backbone of this recipe. In the US I highly recommend Plugra butter, or Kerrygold Irish butter. There REALLY is a difference in flavor. Try a couple of different butters side-by-side and you’ll see what I mean. Professional chefs and bakers often prefer unsalted butter as it is less likely to burn when sauteing and it gives you more control over the salt content of the finished product. Don’t do it. Unsalted butter has a completely different taste (again, try it if you don’t believe this.) Get the salted butter. The butter will be easier to work with if it is closer to room temperature, but it will warm up as you mix it and you don’t want your batter to get too soft because it can melt and separate, so keep it on the cool side. I use mine straight out of the refrigerator, but I have a killer mixer that is not phased by rock-hard butter. There are plenty of great chocolate resources on the web, so I don’t need to spend too much time on that topic here. While Nestle is famous for popularizing the chocolate chip cookie by printing the recipe on the back of every yellow bag, their chocolate is simply not that good. While you can make an adequate cookie using their chips, once you have tried a really good chocolate chip side-by-side, there is simply no going back. Ghirardelli is my favorite chocolate chip; dark and flavorful and slightly larger than the ones you are probably used to. Guittard is also very good, although somewhat harder to find. Don’t even THINK about using Hershey’s. Use a good quality of pure vanilla extract. After all, vanilla is a flavoring and you want the best flavor you can get. Stay away from vanillin or other cheap or artificial substitutes. As for the brown sugar, I like to use the medium brown rather than the light brown sugar. It gives the cookies a more rounded taste and a better color. Now we come to the subject of nuts. Walnuts will give your cookies a crisp nutty flavor and texture, but I don’t think they are a match for the warm richness of pecans. Also, I think the recipe is a little stingy on nuts so I always double the quantity to 2 cups. While you are at it, use halves and pieces of nuts rather than chopping them. This makes the cookies more interesting; they are lumpy and each bite is a little different, ranging from chocolaty to nutty to butterscotchy. Always store your nuts in the refrigerator in a tightly sealed container. Nuts contain oils which can quickly oxidize at room temperature and spoil the flavor. Plus, when we add the nuts to our batter, we will be counting on them to cool it down a bit for better dough handling and better performance of the chocolate. The secret to good baking is to create an emulsion; a very uniform and thoroughly mixed batter. Let’s start with the dry ingredients. Put the flour, baking soda and salt in a separate bowl (not your mixing bowl). Then, mix them together thoroughly by hand with a whisk or fork until they are uniformly blended. You don’t want to come across a lump of soda or salt when you are mixing this into your thick dough later. Now, start blending the other ingredients. Place the butter into your mixing bowl and beat it until it is soft and uniform. Add the white and brown sugar and beat some more until it is all thoroughly mixed. Next, add the eggs. More beating, this time until the mixture is soft and fluffy. Add the vanilla and mix it in well. We are ready to add the dry ingredients from the other bowl. Older recipes recommend pouring them in a quarter at a time, mixing well after each addition. Modern mixers make this unnecessary. Here’s the thing though: the more you mix flour with liquid, the more you develop the gluten in the dough. While this is a good thing in bread because it gives the bread elasticity, in cookies it just makes them tough. Avoid this by stirring in the dry ingredients no more than absolutely necessary to thoroughly blend them. It really does make a difference. When the dough is done, it is time to stir in the chocolate chips and nuts (which, as I mentioned before, I like to keep chilled) Also, I like to add two cups of nuts instead of just one. Add them all at once and just stir until blended. Don’t mix it too hard, or they will break up in the batter and you’ll make the cookies tough. Using a tablespoon, arrange lumps of cookie dough onto the baking sheet so they have room to spread out and bake. The original recipe says “rounded tablespoons” of batter. My lumps are about 1-1/2 inches in diameter. I actually bought a stainless steel scoop with a spring-loaded handle that makes perfect portions. I highly recommend this, but I did without it for years. Preheat the oven to 375 F. Bake your sheets of cookies one at a time to maintain good air circulation. Plus, this way you can work on one cookie sheet while the other is baking. Set the timer for 13 minutes. When you take out one cookie sheet, you can put the other one in immediately (before the oven cools off). Place the hot cookie sheet somewhere it can cool (not on top of the oven). Your cookies, when they come out, should be ALMOST completely baked, but they may still be a tiny bit translucent in the center. Because the cookie sheet is still hot, they will continue to bake as long as they are on the sheet. I generally give them a minute, then using a pancake turner, move the cookies off the sheet onto a brown paper bag or wire rack to cool. After the cookie sheet has had a chance to cool, you can start putting the dough on it for the next batch of cookies. If you followed these instructions to the letter, you are now the proud owner of a few dozen of the best chocolate chip cookies you have ever eaten. I hope you enjoy them as much as my friends and I do! Rick, Who could have imagined that I would be sitting at my desk reading a cookie recipe by you. The web’s an amazing thing. Remember the letter game you created for your son about 19 years ago. I have a whole business built around that same stuff. like i said, it’s amazing…. I remember that application well. Thanks for dropping by. Enjoy! That’s pretty funny! Thanks for the note. Really good question. I’m going to edit the article to fix this. The answer is “salted”. professional chefs will often tell you to use unsalted butter because it gives you better control of the salt content in a recipe.I disagree with that answer because salted butter has so much more flavor. It has something to do with how the butter is cured. Also note that all butters are not created equal. “Plugra” brand butter is harder to find, but well worth the trip to another supermarket. It’s absolutely fabulous. My second choice would be Kerrygold Irish Butter, followed by Danish Creamery. You may have other butters in your market that are also really good. Taste them side by side and you’ll be really surprised at the differences. I’m planning to make these cookies one more time — especially since today I got an email from Martha Stewart that contained (supposedly) the best chocolate chip cookie recipe of all time. When I served the first batch to my brother and nephew they actually stopped a moment and exclaimed at how good they were. I’m making them for a get together at my house that is a meet and greet for a political candidate. Probably a very forgiving audience. And, yes, here in the hinterlands in Washington, DC, we do have Plugra butter and Kerrygold Irish butter. I will definitely try one of these brands. Thanks again for the recipe. I will keep you up to date on my baking adventures.